I just returned from four days in Houston, Texas, where I spoke on Tuesday, November 10, at Alexander Hamilton Middle School. 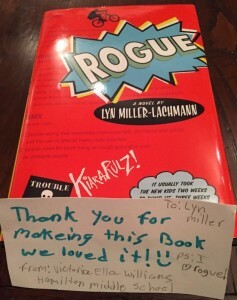 The school had selected Rogue as the “One Book, One School” read, and it was a thrill to be at a school — a very large school at that — where everyone had read the book. I spoke at three grade-level assemblies; greeted students, faculty, and staff in the library and at lunch in the Principal’s Office (I appreciated being in the Principal’s Office for a good reason, because that wasn’t my experience growing up); and meeting parents and signing books at the Family ELA night. 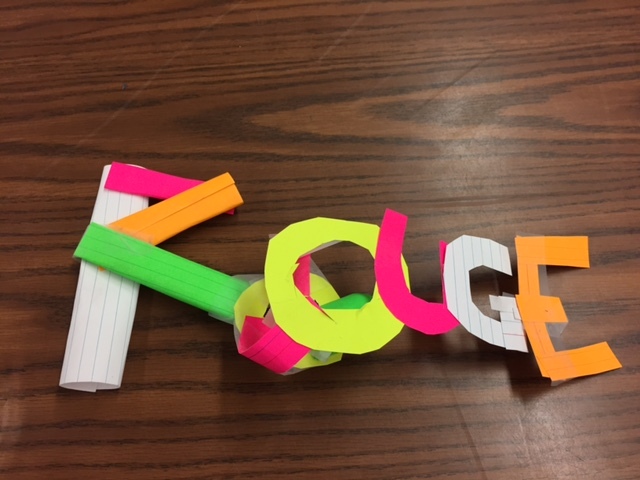 3-D student art to accompany the book. I started each of the grade-level assemblies with an icebreaker, one that I remember from my first day in graduate school at Vermont College of Fine Arts: name, and three facts about myself — two of which are true and one, made up. By a show of hands, students tried to guess which of the three facts was not true. (All three groups guessed wrong, the sixth graders by a larger margin than the others.) I gave a bit of personal history, beginning with my becoming a “writer” in first grade before I knew how to write. Because I struggled to understand the class rules and make friends with the other students, I spent a lot of time on the outside, watching. I made up my own classroom, just like my real first grade classroom, but the students had different names — names that I liked better — and I knew who was friends with whom, which kids got good grades, and which ones were always getting into trouble. Over the next few years, as I put my stories to paper, my teachers let me read them to the class, and I was able to judge whether my stories were boring or confusing. It was enlightening for me, and I think for my peers too, because I had something to offer and wasn’t just that “weird” girl. Thank you for the great review, Victoria! Even though I started talking at a much earlier age than Temple Grandin did, she also got into fights at school and cried when people were mean to her. When she was going into ninth grade, her parents sent her to a special boarding school for emotionally disturbed children where she learned to talk to animals, like horses that had been mistreated. When I read that part, my stomach tightens up, and I can’t eat anymore. I don’t want to have to go to a special school. And I want friends who are people. Not horses. Anyway, Dad can’t afford a horse. I keep going because I know that if Temple Grandin wrote a book, she must have turned out all right. I asked the students with Asperger’s about their special interests, and in the assemblies, I shared mine — my LEGO town and making up scenes and stories with the minifigures that I photograph for Instagram. 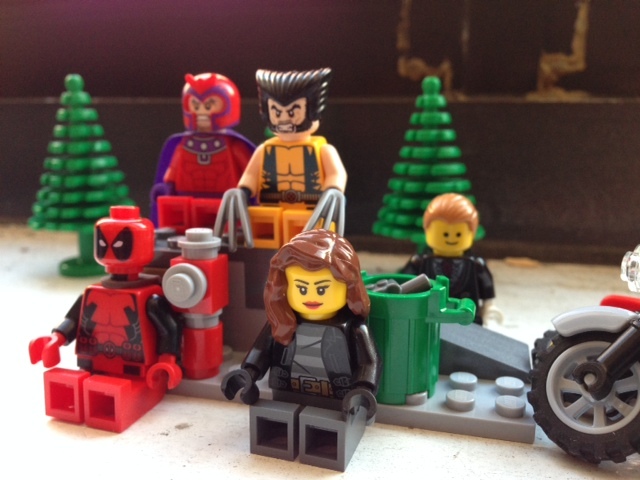 I had slides of the Rogue Players — five minifigures that included Wolverine, Magneto, and Deadpool from the Marvel X-Men sets (which is why Magneto and Deadpool show up even though they have no character equivalents in Rogue) and the custom figures I made to represent Rogue and Gambit. I took these minifigures to a conference in Seattle in February 2014, and I showed slides of their time there as they saw the sights and looked for new jobs once the novel Rogue had launched. I also talked about my work as a translator, and how Asperger’s has given me a special talent for learning languages, just as Temple Grandin has a special talent for understanding the way animals see the world and communicate. It is no coincidence that she titled her book, the one that Kiara reads, Animals in Translation. The Rogue Players, from left: Deadpool, Magneto, Wolverine, Rogue, Gambit. While I wrote Rogue for people like me growing up, I also wanted the book to make non-autistic children and adults aware of what we have to offer. My presentation at Hamilton Middle School had the same goal, and I was thrilled with the reception I received from the students. If they’re representative of young people today, we have good reason to be both proud and optimistic. These lovely young people promise a more inclusive future, one that welcomes people with all their differences and with a common goal to create a better world for everyone. Thank you to the Hamilton Middle School administration, staff, faculty, and students who gave me a warm Texas-size welcome and made my visit a wonderful, unforgettable experience! What a fabulous time at Hamilton Middle School! I loved reading about it and loved seeing the Rogue Players in Lego. Thank you, Sandra! The Rogue Players ended up as part of a fundraising auction for VCFA, so they went to a good cause and a good home. How lucky the Alexander Hamilton Middle School students were to hear your personal experience and how it informed Rogue. Bravo! Thank you, Susan! They definitely inspired me as much as I inspired them! Thanks for posting this from-the-heart story, Lyn! It’s tremendously inspiring. It was an honor meeting you in SF last June. I was thrilled to meet you as well, Julie! And I hope things are going well with ROAR! and you’re getting some school visits of your own. I’ve never spoken to an elementary school class (yet) but would love to know what it’s like. Oh Lyn. Would you believe it? We were in Houston at the same time. I would have loved to see you. But Mom had surgery that day, so I was taking care of her. I’m so glad you got a chance to visit that school. It was good that you could be with your mother, and I’m glad her surgery went well. I hope she has a speedy and smooth recovery.